In 1949, in Trieste, a port city in northern Italy, Giorgio Kriegsch was born to devout parents: a Catholic mother and Lutheran father. His father moved his young family to Berlin for work then returned to Trieste four years later. At twelve years old, young Georgio began playing the guitar, a pursuit he continues to this day. 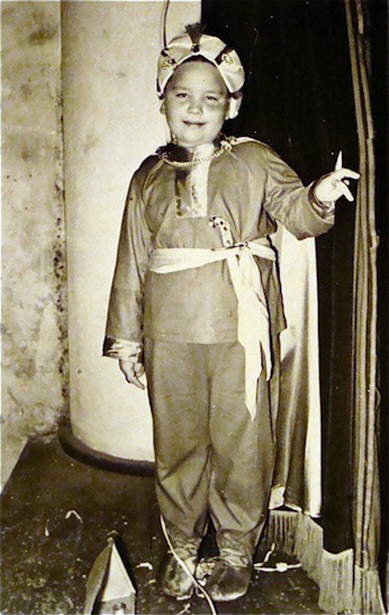 He later taught himself piano. After graduating from high school, Giorgio worked for insurance giant Lloyd's of London, principally in shipping goods to and from India—his first India connection. At the University of Bologna he studied agriculture and music, specializing in rock and folk music. In 1975, Giorgio read Autobiography of a Yogi by Paramahansa Yogananda. This book transformed his life and he began his spiritual journey in earnest. Giorgio was initiated into Transcendental Meditation, and later took Kriya Yoga initiation in Holland from a visiting monk, Swami Hariharananda — a direct disciple of Yogananda's guru, Swami Sriyukteshwar Giri. Giorgio first traveled to India in 1986. There he volunteered with Mother Teresa's Sisters of Charity to help care for the destitute people of Calcutta. He worked massaging their extremities to provide comfort and hand-feeding those too weak to feed themselves. This caused him to become ill and he was forced to quit this work. He eventually resumed his travels in India visiting many temples and sacred sites. Swami Nirvanananda has since traveled to India more than twenty times. During his travels, Giorgio discovered the inspiring work of Father Marian Zelazek, who was helping the children of lepers in Puri, a city in eastern India. The children lacked basic survival necessities and had no opportunity for any formal education. Father Marian was working to build a school using funds he had received from the German government after being imprisoned in Dachau concentration camp in World War II. In 2002, Father Marian was nominated for a Nobel Peace Prize for his work in India. Giorgio asked how he could help and Father Marian gave him photos of seven children from the leper colony. He asked Georgio to seek sponsors for them. Giorgio performed kirtan (a form of devotional chanting) concerts in Italy to generate money for the Puri children; thus a new life mission was born. In 1992, in the holy city of Jagannath Puri in India, Giorgio took the final monastic vows of sannyas and became Swami Nirvanananda Saraswati, meaning "the bliss of freedom from suffering." A swami is a monk who renounces worldly pursuits in favor of a spiritual life of simplicity and service. Merging the teachings of Kriya Yoga with the devotional aspect of Bhakti Yoga and the charitable path of Karma Yoga, Swami Nirvanananda expresses unity in the diversity of many paths and religions, all leading to the same goal: Universal Love and Oneness with Spirit. Swami Nirvanananda in concert Since that time, Swami Nirvanananda has traveled extensively throughout Europe, the United States, and India, inspiring audiences with devotional music and raising funds from CD sales and donations to help others. Shantipuri Friends Foundation is a 501(c)(3) nonprofit public charity dedicated to supporting the charitable work of Swami Nirvanananda. In addition to continuing Father Marian's efforts to wipe out leprosy, Swamiji has expanded the scope of his mission to include various additional projects in the area surrounding Puri, Odisha, India. If you would like to support Swamiji and his work, you can make a tax-deductible donation to SFF. Following World War II, Father Marian Zelazek, a Polish priest, eagerly accepted the call to conduct missionary work in India. Near the City of Puri, in Orissa, he watched the inhumane treatment of people afflicted with leprosy. It reminded him of the conditions he lived through as a prisoner of Dachau Concentration Camp. With the help of Sister Amelia Sbrissa of the Italian congregation of the Sisters of Charity, Father Marian created a home for the lepers: the Mercy Village Leper Colony. Today, more than 500 families inhabit the colony and live full, productive lives. In the Mercy Village the lepers lead a fairly normal life where they can work inside the community and raise a family. Everyone is provided continual care by a doctor and has access to all the medicine they need from the village dispensary. The children are also treated periodically as a preventative measure. They all go to school much to their own great benefit and the benefit of the whole community. The prejudice and stigma of leprosy continues. The children of parents afflicted by leprosy are barred from attending school even though they are healthy. In 1983, Father Marian built a school for them: a straw-thatched hut with a dirt floor. This humble beginning has now grown into a school that has a reputation of being one of the best schools in the area with high academic standards and rich extracurricular programs such as traditional dance and music, hatha yoga, computer skills, and tae kwan do. Each child receives a uniform, play clothes, daily meals, school supplies, and regular medical care, all free of charge. Their education allows them to pursue productive vocations and start their own families––ending the cycle of hopelessness and poverty. Father Marian’s dream was to expand the Beatrix School through high school. In order for the children to complete their studies beyond grade 7, they must travel to different schools in the surrounding areas and pay uniform and school fees; thus many do not continue. In April 2011, thanks to the diligent efforts of Swami Nirvananandaji and others, the new Father Marian Memorial Beatrix School broke ground. In 2012, the school accommodated students from kindergarten–7th grade. Now, with your support, it includes students up to 10th grade and in April 2014 it will be complete with students attending through 12th grade! The school has a total student body of 650. More than 300 students come from families outside of the leper community who formerly feared contact with the children of the afflicted. The Beatrix School, begun because of segregation, has truly become a center of integration. Because it is run as a private school, it has the freedom to incorporate spirituality and human values into the standard academic curriculum. It operates solely on donations. Each donation sustains this work and helps to uplift the community one child at a time. Thank you for your kind support! 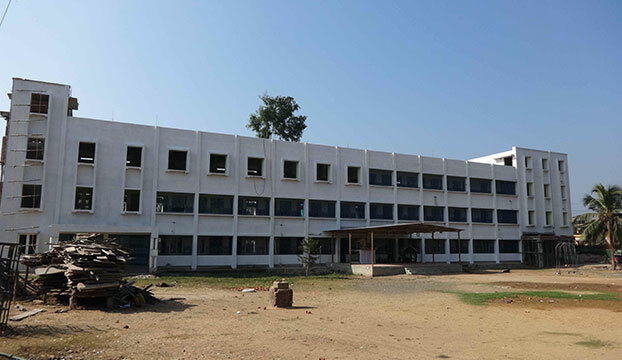 Your donations to the Shantipuri Friends Foundation will help complete the construction of the new three-story building and support its maintenance and operation. More than ten years ago, Father Marian, the founder of the Mercy Village Leper Colony and Beatrix School in Puri, started a project to give at least one cup of milk every day to all of the children living in the leper colony and/or attending the school. This project costs only 70 cents per child for one month which gives these children the chance to become stronger and healthier. For thousands of years Puri has been a major pilgrimage destination. There is a large temple and shrine dedicated to Lord Jagannath. In recent years, the international tourist traffic has also opened the doors to organized prostitution, which has exploited young girls who face so few options for a productive livelihood. In 2002, the Sisters began to give shelter to these girls in the fishermen’s village of Penta Kotta near Puri. Thanks to generous donations, they have started construction on a new home for twenty girls. The girls receive schooling and learn tailoring and other simple jobs that can provide them with adequate income, thus giving them a chance for a better future. 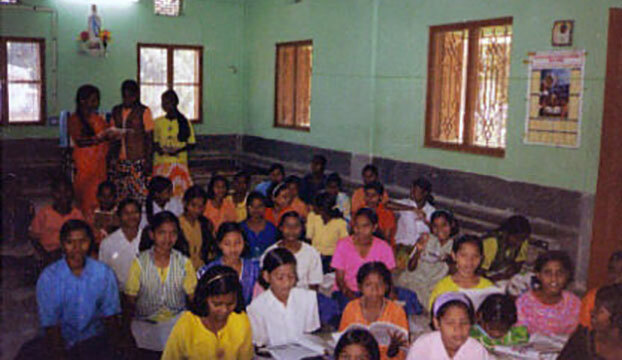 The girls’ hostel in Birikote, Orissa provides housing for 68 girls. These girls come from various small villages and are attending school from 1st to 9th grade in Birikote. Since these girls are very behind in their studies, the Sisters have appointed a teacher for private tutoring. They also employ a caretaker and a cook to help care for the children. Your contributions help with food expenses, school supplies, and hostel maintenance. The school of Sikermaha is situated in a remote village 100 miles away from the nearest railway station at Berhampur. The Sisters of Charity started a vocational program for twenty teenage girls to attend tailoring classes and receive non-formal education which will help them provide much needed income for their future families. They can also teach others in their villages these skills. These girls are dependent upon donations to provide for their food, clothing, and materials for their studies. Recently, the school has been expanded to include younger girls from age 6. 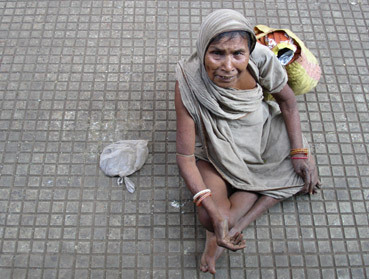 Services for the physically-challenged are scarce or non-existent in the mountainous Kanadamal District in Orissa. The small villages of the Kondhs and Dalit tribes are scattered in the forest unconnected by roads. The Sisters of Charity started a home for physically-challenged girls in the small village of Udayagiri. The local diocese donated the land for the building and provides a vehicle for transporting the children to school each day. The Sisters’ goal is to provide rehabilitation services through corrective surgery, physical therapy, and formal education. Currently, there are now 27 girls living in the home and more are expected to come. This home for handicapped girls is a very new venture and has many needs including basic furnishings, funding for physical therapists and equipment, transportation to Bhubaneshwar or Berhampur hospitals for medical examinations, consultations, and surgeries, walking aids such as calipers, wheel chairs, crutches and special shoes, and funding for the daily expenses of food, clothing, and sanitation. Father Marian Zelazek was born in Poland in 1918. In 1940, he was arrested by the Nazi Gestapo and sent to the concentration camp at Dachau, where he remained imprisoned until the camp was liberated by American forces in April 1945. After his release from Nazi internment, he traveled to Rome to study theology, and was ordained as a priest in 1949. In 1950, Father Marian was sent as a missionary to the Indian state of Orissa (now called Odisha). He worked for 25 years in the Rourkela district before moving to the coastal city of Puri in 1975. In Puri, he was moved by the plight of a large number of people afflicted with leprosy. They were completely ostracized from the community. Even the otherwise healthy children of lepers were not allowed to associate with the children of healthy parents. His experience in the concentration camp gave him an insight into the suffering and poor treatment of those afflicted with the disease. Inspired by the work of Father Damien of Moloka'i, Father Marian organized the leper colony and saw to the treatment of over 600 lepers. He provided them with shelter, medical care, and a chance to earn a living (at that time, lepers were considered by many to be cursed by God and had to survive by begging). He later founded the Beatrix School, which gave the children of the leper colony their first opportunity at an education and a chance for a brighter future. The school was not limited to the children of the leper colony, and soon many children of non-lepers were also attending. This integration has played a very big role in removing the stigma surrounding leprosy. Father Marian strove to diminish that stigma further by introducing the lepers to the community and showing that they were not to be feared or reviled. For his tireless work in the leper colony in Puri, Father Marian was twice nominated for the Nobel Peace Prize.